Attached to the plate by way of tee slots are seven base mounts with vertical posts and clamps. The mounts are secured to the base plate by thumb screws and tee nuts for fast, rigid clamping. No wrenches are needed. The posts have 3/8″ shaft and have 4.5″ of vertical adjustment. The upright assembly clamps have been designed with thumb screws for fast and easy height adjustment. The design of the Model 980 assures ample lateral, A/P and vertical travel of all components. Model 981C Mouse Retractor can be substituted in place of 981B or ordered in addition. Combines optimum rigidity with maximum flexibility for accurate and reliable placement. Modularity allows the use of a wide range of components and accessories. 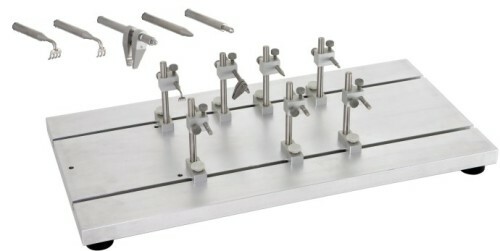 Model 900 series Small Animal Stereotaxic Instruments can mount onto the Model 912 Spinal Base Plate.